Is this not the cutest garland you've ever seen? I got the idea from eighteen25, who in turn used scrappergirl's tutorial (WARNING: MUSIC ON BLOG). I used Stampin' Up's Love Letter polka dot and Bella Rose red floral paper and some sheer pinky-red ribbon (hint: use a thick needle to string the hearts onto the ribbon). Each heart is made with two 1x5 inch double-faced paper strips. The photo strips were easy (and fun) to make (tutorial below). Step 1:Gather photos. I use Picasa, which made this so easy. I went through my photos and pinned any I wanted to use (see screen capture below). Then I exported them all to a new folder I called "valentines" (clever, huh?). Having them all in one folder makes them easier to batch edit and to find later, plus you're not messing with your originals. Step 2: Batch edit. Clear your holding tray, then select your "valentines" folder. At the top menu, select picture --> batch edit --> black and white. Step 3: "L7, you're a square, dude!" Crop each photo to a square. After selecting crop, you can choose "Square: CD cover" from the pull-down menu (see screen shot). It doesn't matter what size your square is, we'll make them all 1x1 in Word. Step 4:Word is the Word, baby. Open a new Word document and make the margins as big as your printer can handle (you can do this by dragging the margins along the rulers on the top and side, or by going to page setup and entering in new measurements). I went with .25 at the top and bottom so I could get 10 inch strip. I tried to go with .12 at the sides so I could get 8 strips, but the margins were too small for my printer. Step 5: Insert your pictures. In Word 2007, click the insert ribbon, then picture. Once you go to your easy-to-find Valentines folder, you can use "shift" to select multiple photos at once-I suggest about 5 at a time so your compute doesn't wig out. Click the first one, then hold shift as you click the fifth one (another hint: you can hold down control to select multiple files that are not in a row). Repeat until all your photos are inserted. Step 6: EEEK! They're all crazy different sizes!! No worries, man! Double-click the first one so the "picture" ribbon shows up. On the right of the ribbon, enter in "1" for the height, and your width should automatically change to 1 (sometimes mine changed to 1.01 or .99...that's ok). Continue for the rest of the pictures. Word will automatically put them in a line with a wee little space between them, but the next row will be right under the previous one with no gap. I was able to get 7 columns of 10 pictures each, which meant I could make 7 hearts from one page. If you don't have enough photos, just copy and paste the same ones again! Step 7: Print. I printed mine onto Gina K's cream paper for the hearts and onto PTI's white paper for the card. Additional step for card: Insert Amber Ink's ipaper jpg into a new Word document and double click the picture. 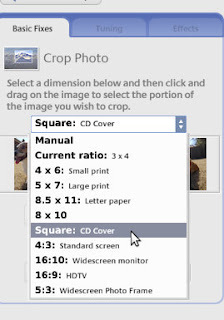 Then select "crop" on the picture ribbon, and crop the paper to the amount you'll need for the squares. That way you can print just the amount of paper you need and not use up a whole sheet (and even print two blocks of different ipaper at the same time), but the scale of the paper doesn't change. I love this garland almost as much as I love Word. Hope this inspires you to get geeky this weekend! Learn to love Word and it will love you back. Cool card and what an amazing banner! Love how you used the photos - looks fab in those colours! Off to be a geek. it turned out awesome!! love the papers you used and great tutorial! thanks so much for sharing. I'm saving this forever and storing it on the AmberInklings blog. Thanks! OK, update: just made some Dexter photo strips. I'll probably scrap them. Worked like a charm, even in OpenOffice!